Hi Adventurers! Marie here, Director of Just Boarded. Just a quick post to tell you about the great interview I had yesterday with a local French newspaper – Le Republican Lorrain. I met with the lovely journalist Frédérique Thisse who was eager to learn a bit more about what we do, here, at Just Boarded. We talked about everything from our values to the new exciting destinations we are working on. The article has been published in today’s newspaper and I’m even on the front page (crazy!). Fancy practicing your French? It’s right here. 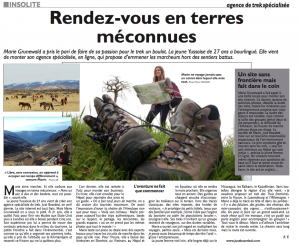 Marie mentioned her adventure in Nepal « I walked for nine days and met less than ten travellers. It was like having the Himalayas for myself ». Her travel agency offers authentic trips, based on respect, « where you won’t come back with the same pictures as everyone! ». Just Boarded is offering four destinations at the moment: Slovenia, Vietnam, Nepal and Ecuador but Marie has many more in mind. She is testing the itineraries herself and works with local experts to map the route. She takes care of all the logistics while her local guides look after the groups in country. Her aim is to stay away from the touristic routes and crowded places « I prefer small hotels, run by families for example. I like the idea that my business will help local people » she says. Her treks are for small groups of travellers and range from 6 to 12 days. Marie is obviously travelling a lot, sometimes alone « but in the recent months, I also spent a lot of time behind my computer » slips the entrepreneur. The young woman has ambition, she is constantly thinking about new destinations, in Europe or further away, not forgetting about the region she comes from. For her, everything is worth seeing. She has the ambition to visit the whole world. She smiles and says « With a backpack and walking shoes, everything is possible ». ← Top 7 places to visit if you are vegetarian.